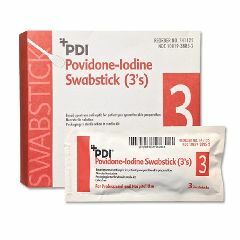 The Povidone Iodine Prep Swabsticks are perfect for venipuncture, I.V. starts, renal dialysis, pre-op prep, and other minor invasive procedures. Non-irritating and virtually non-stinging for better patient comfort. These Swabsticks are frequently used prior to cathing to minimize infection. PVP Iodine provides longer germicidal activity than ordinary iodine solutions. Used to clean/sanitize area prior to inserting a catheter. I buy this product regularly. Lightweight. Sturdy. Can take the product with. bladder issues. damaged back. Cath regular, very conven. I use these for cathing as it cleans well and kills bugs that can enter bladder. Easy to carry and convenient to use. Love them. This product is a good one. Convenient. Convenient. Not messy. Easy to use. As instructed by my surgeon, I used the swabsticks twice a day to clean my incisions. Easy to open &amp; use. Better than applying from a bottle. Hello, I would like to buy this product in Hong Kong. Please let me know the supplier in Hong Kong. Thank you very much.